It may not correspond to the Chinese calendar, but for Picasso, 1952 was the year of the goat. Two years earlier, he had drawn a few goat’s skulls, painted a wonderful reclining goat (entitled, simply, Goat, PP50-002) which now rests at the Musée Picasso, and also fashioned his charming, large bronze sculpture, the She-Goat, of which there are two casts, one at the Musée Picasso Paris and the other at the MOMA. But in 1952, Picasso’s pet Esmeralda must have caught his eye in full force, because he created a number of astounding portraits of her in several media that year, including a number of paintings, a few incredible prints (a lovely but tiny etching, Bloch 697, serves more or less as a reprise of the bronze, and two wonderful but somewhat macabre aquatints of a post mortem goat head, Bloch 691 and 696), and some ceramics, including this stunning masterpiece. Let’s give a name to the artistic style of this ceramic: Geometric. 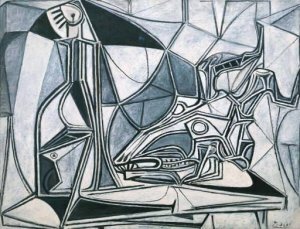 Since the time of Les Demoiselles d’Avignon, in which Picasso carved space as if with a knife, with a result more akin to a misshapen geode than any habitable room we’ve ever entered, numerous novel iterations of this signature style formed the substrate of many of his best works. Though the term Cubist is often applied to these instances, I rather think it is misapplied. In my opinion, the term Cubism is best left to the work that followed hot on the heels of Les Demoiselles and ended with Synthetic Cubism in the ‘teens. The fragmentation of design in that oeuvre is quite different than the many new styles that followed it, though it certainly could be said that the later styles borrowed from it and built upon it. This goat ceramic, and the closely related painting of the same year, Crâne de chèvre, bouteille et bougie (at the Tate Modern; see below) are exemplars of the Geometric style. Picasso carved the design of this ceramic in wet clay. He then had the clay fired, and the hardened designed served as a mold for the finished product. Thus, the plate shows the design of the goat in relief, raised lines in a pattern typical of the Geometric style. (“Geometrism”?) The plates were then variously painted and glazed. These goats bear a distinct smile, which reliably evokes a corresponding one in the viewer. We’ve named her Esmeralda, after Picasso’s eponymous pet. 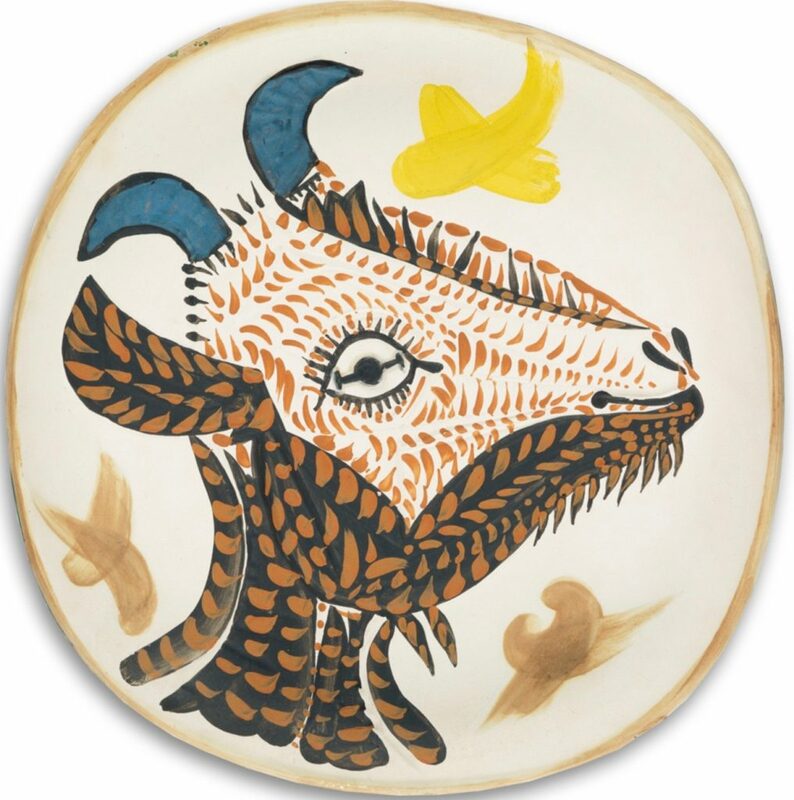 Due to Esmeralda’s happy face, the brilliant geometrism with which Picasso carved her, the lovely way in which she has been painted and glazed, and her substantial, life-like size—this plate is pleasingly massive—this is in our opinion one of the very best of Picasso’s editioned ceramics. The blue horns are a lovely, unusual, and possibly unique feature in this hand-painted impression, as I have never seen them in any impressions of the five versions (A. Ramie 151-155) of this original print.